File this under "in case you're there". The Lakewood, Colorado Cat Care Society is taking it up a notch to find homes for their beloved felines. After 32 years of baked goods, the annual Santa Paws Festival, to be held Fri., Dec. 6 and Sat., Dec. 7 on site at the society, will host its first ever Christmas Cats Auction. Usually, the society that helps find good homes for cats rakes in about $6,000 or $7,000 at the Christmas bake sale, wreath making and cat festival. This year, according to Maggie Holben, a member of the Cat Care Society’s board of directors, they’d like to bring in $20,000. 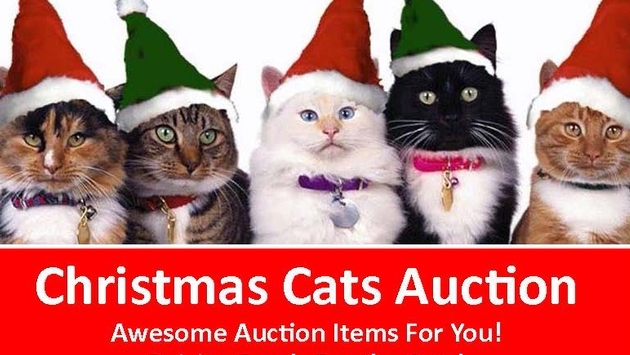 That’s why they started the Christmas Cats Auction. Twenty prizes will be auctioned off this year including jewelry, figurines, and gift cards from local stores. As a special incentive to lure cat lovers, the society will give away 75 ceramic Jingle Cats tchotchkes starting on Friday at 12 p.m. to anyone who spends $100 on items at the festival. The adorable decorative kitties are sure to go quickly. Please note only one per person while supplies last. The festival is very popular with locals and those further afield. People line up at Ellen’s Bakery Shop Friday morning for the baked goods, according to Holben. “They even drive in from the outer metro area,” she said. The bake sale has all the “old standards: cookies, breads, fudge,” according to Holben. Cairo’s Bazaar will sell collectibles like pendants and cookie jars. Each section of the festival has been named after a shelter cat available for adoption, like these two beauties. Ellen is a “Brown Tabby and White” type of cat who is 11 years old, 3 months old. Ellen would love to get her paws on the baked goods as she’s a little “chubby,” said Holben. They will make sure to keep the kitty away from the bake sale. Cairo is 13 years, 1 month old and is a black cat full of love for the right owner. At any given time of the year, the shelter has about 90 to 100 cats available for adoption or in foster families. The Society asks that people do not give kittens or cats for presents. Instead, they suggest that people give a gift certificate from the shelter and let individuals decide what cat to get and whether or not they can commit.